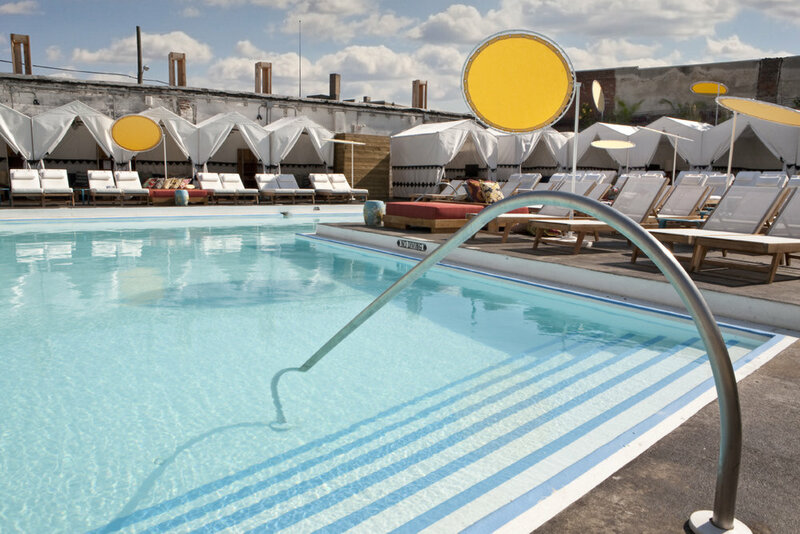 Located in Philadelphia’s Northern Liberties neighborhood, Arrow Swim Club is designed to evoke the spirit of the surrounding area; a bohemian-chic hideaway in the heart of the city’s turn of the century industrial past. Inventive and artistic, the design fuses wild and unconventional with jet-set sophistication and glamour, befitting the neighborhood’s reputation as the center of art and creative energy in Philadelphia. The brick façade of the original, 1920’s factory building remains largely unchanged, but is punctuated with dense greenery surrounding the entry doors and hinting at the sun-sprayed getaway that lies within. 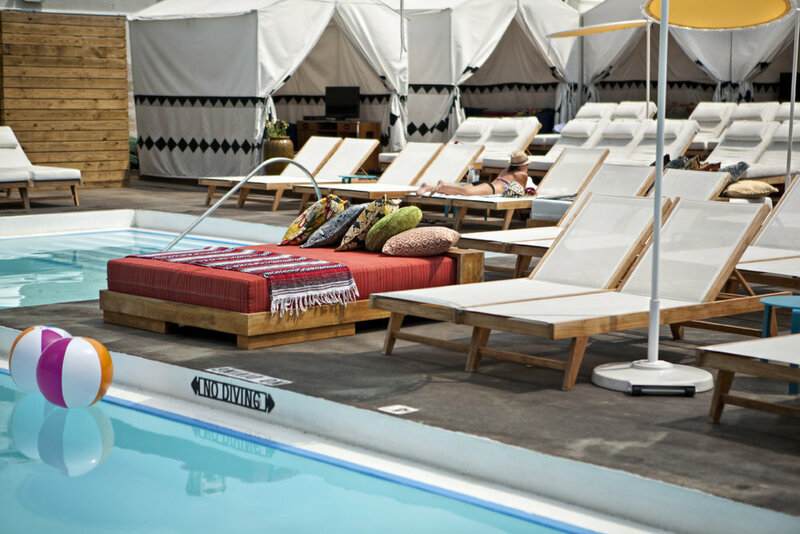 The pool deck features a 1,400 square foot heated, wading pool surrounded by teak chaise sun-loungers and custom printed canvas tent cabanas inspired by a nomadic caravan. 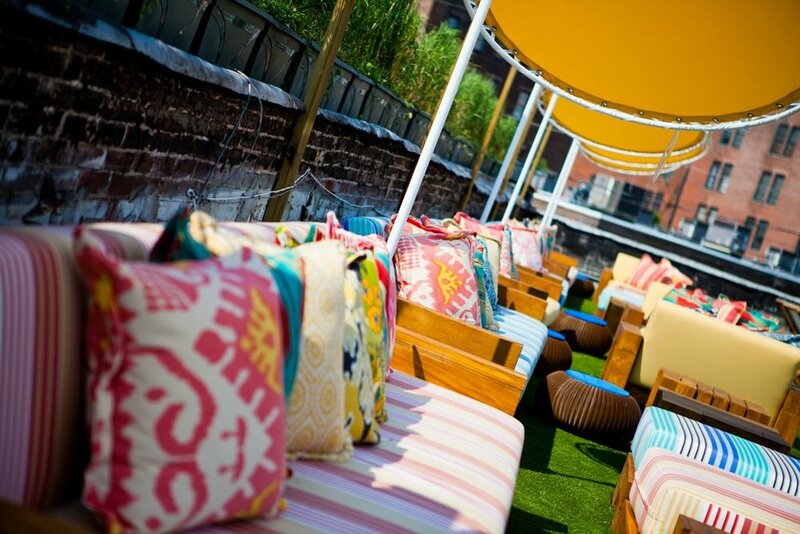 Perched on a multi-level raised wood deck, cabana tents feature sectional sofas, kilim area rugs, reclaimed industrial cart tables and case pieces modeled after the flight cases favored by touring rock bands. Moroccan ottomans and tribal stools evoke a sense of international wanderlust and originality. A 24’-0” diameter sectional sofa upholstered in a custom ikat fabric surrounds a fire-pit located adjacent to the pool. Overhead, a trellis constructed using reclaimed timber from the original factory building supports twinkling strands of lights and hand-woven Mexican hammocks for casual relaxation. Additional poolside amenities include outdoor ping pong tables, a covered bar and dining area and outdoor showers. The mezzanine level sundeck above features two levels of sun-bathed leisure with birds-eye views of the pool deck and the city skyline. The 90-seat restaurant draws inspiration from the desert Southwest with faceted ceiling panels angled to produce a rhythm of light and shadow to create a changing visual experience, and floor to ceiling glass walls overlooking the garden landscape beyond. Banquettes and dining chairs upholstered in heritage Pendleton wool fabrics introduce pattern and color, while vermillion colored tables with brass bases add a dash of 70’s glamour. A large scale, black and white ceramic tile mural features geometric patterns inspired by traditional Native American arts and fractal geometry. The secret garden outside is a lush, green oasis in stark contrast to the dense urban environment beyond the walls. Conceived as an outdoor living room, the 3,200 square foot patio is landscaped with leafy deciduous trees, tropical plants and ivy-covered walls, features a fire pit for cool summer nights and is adorned with an eclectic mix of platforms and furniture.